One of the pioneers in the enterprise B2B influencer marketing space that I’ve been most fortunate to collaborate with most is Amisha Gandhi, (AmishaGandhi) Vice President of Influencer Marketing at SAP Ariba. Whether it was the SAP Leonardo launch microsite with interactive content and 30+ influencers sharing their expertise reaching 21 million views or campaigns like this one with Arianna Huffington plus internal and external influencers for SAP SuccessFactors, there’s a lot of success in the momentum Amisha has created in the B2B influencer marketing world. As the creator of SAP’s Global Influencer Program, Amisha has numerous B2B influencer marketing case studies being used in articles and presentations all over the industry. Now her focus is specifically with the Ariba global program that also includes working with analysts, communities and brand partners. 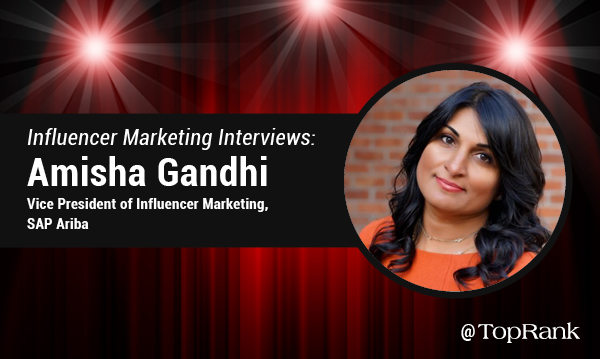 In this interview, Amisha talks about going beyond creating awareness to working with influencers to engage specific customer personas across the entire customer journey. She also shares her favorite tools and her vision of what influencer marketing will be in 2020. Many B2B companies focus on their influencer partnerships to raise brand awareness and engagement. How does working with influencers in B2B help drive leads, sales and revenue? A lot of companies focus on the awareness piece of influencer marketing and that would be called influencer relations. Influencer marketing focuses on the entire customer journey, driving demand, leads and to help with nurture. This includes co-creating content for demand generation with influencers, having them as speakers on your lead generation activities such as webinars and involved with your high value, high touch customer activities. With influencer marketing, you’re looking to offer a better experience to your customers and deliver knowledge-based educational content with a third-party voice. These experiences can be achieved through content, influencers speaking directly to customers, nurturing them through digital and high value assets. This is the approach with influencers will help you to drive sales journey and demonstrate pipeline touch. How is influencer marketing positioned within your company? Ex: independent department that serves the brand and departments / business unites or is it more decentralized? What are the advantages of that structure? Influencer marketing sits within global marketing at Ariba under corporate marketing. Ours is somewhat of an unconventional model with an influencer marketing team comprised of analyst relations, third party communities, external business influencers, and advocacy. The advantage of this structure is that it allows us to bring communities of influence together to help drive real business outcomes across the entire customer journey. What tips can you share about being more effective about influencer identification, qualification or recruitment? The biggest piece of advice I can share is don’t just look at popularity metrics and social media following. Go beyond what the numbers are and see what that data really means. Don’t just look at followers, look at engagement. at who influencers are engaging with, how many comments they receive and how long they’ve been engaging. Also, don’t just rely on social media. Look at which influencers are speaking at conferences and who else they are connected to. Often times influencers on a specific topic are at similar conferences and engaging on social with each other. Start seeing those connections because that’s going to help you create a more effective program. Look at the conversations influencers are driving and take a deep dive across all their channels. Discover what they are writing about and where and if it fits with what you are doing and the audience you are trying to reach. When recruiting an influencer, make sure that it’s clear you’ve spent quality time getting to know what they care about and why they should care about you. Make it really clear what’s in it for them, not just what’s in it for you. When recruiting an influencer, make sue that it’s clear you’ve spent quality time getting to know what they care about and why they should care about you. Make it really clear what’s in it for them, not just what’s in it for you. What characteristics make for a successful influencer / B2B brand relationship? The biggest misconception about influencer marketing is that it’s all about social media and that you should buy influence to shout out marketing messages. Companies should approach influencers as partners, not just as people that they can use for their marketing efforts and launches. Often times the influencers will share their view of the market bringing in insights that you don’t have, and you need to be open to this as well. You may not like what you always hear, but it can bring an outside-in perspective that can inform the business. What advice can you share about measuring success with influencer marketing? When you are implementing an influencer marketing campaign understand the business outcome that you are helping to achieve. Once you know the specific business outcome, put the metrics you want to track in a dashboard. For example, with a campaign that involves an eBook, your metrics might include social media shares, social impressions to see how it was promoted by influencers, views or downloads depending on how it’s set up. If you set up measurement correctly with the right tagging you can see how much touch the asset had. If you have Marketo you can see when people come to the asset and where they go after, which helps inform your customer journey and how the influencer marketing pieces are working within your entire marketing landscape. Once you have those metrics in place you can use them as a benchmarks so the next time you have a program you can go back and see what your baseline measurements are. A lot of marketers look at social media impressions and social engagement. In B2B influencer marketing, there’s a lot of focus on engagement with assets and the customer journey, so you will want to make sure you have like minded metrics that fit into your marketing landscape that people will understand. For example, if you did a webinar with influencers, you might say you saw 2X leads and 4X engagement which is going to be important way to report performance. Even if you don’t have hard numbers, you should be able to share comparative metrics so that people understand the value of using influencer marketing versus not . It is important to have both quantitative and qualitative metrics. It’s important to show both the art and science of influencer marketing. Speaking of technologies, any favorite tools or platforms you can share? Some of our favorite tools are Traackr, Marketo & Sprinkler. These are all tools that can help you show the measurability of influencer marketing and to quantify the program. How do you think influencer marketing will have evolved in the next year or two? What will it look like in 2020? I think influencer marketers will start to look beyond influencer relations. Today you see a lot of influencers at events and I think in the next few years you’ll see a lot more influencers during the demand cycle and involved with more content and activities deeper in the sales funnel.